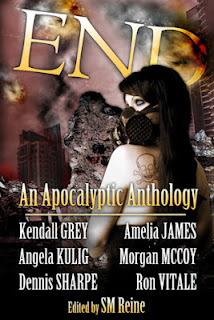 Just a quick update, as I have a very challenging blog scheduled for tomorrow-- END: An Apocalyptic Anthology; is currently free for Kindle. I didn't know of the sale in advance, or I would have warned you! Run and get it because I don't know when it's ending either. I feel sort of like this is somehow opening wounds I just stitched shut. My story in it called, A Starshot in Hell was what got me on Red Iris last year. I'm feeling nostalgic, so go download it then give me some love! Trapped on a dying Earth, Eden must decide to flee with a man she hardly knows or stand her ground as it crumbles below her feet .